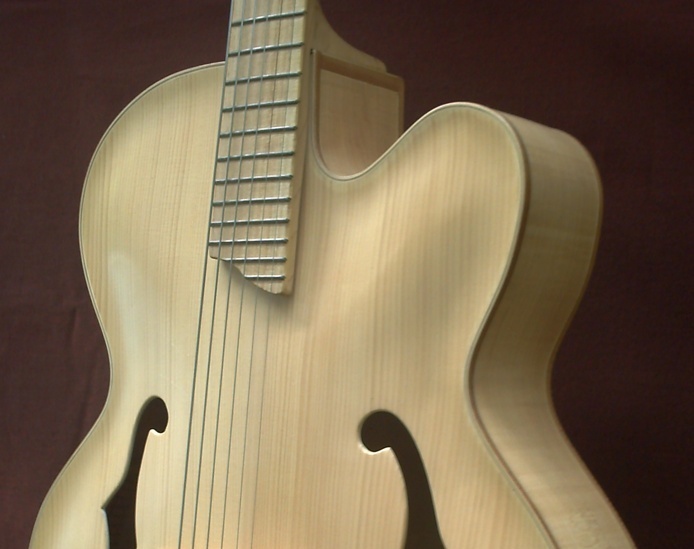 This 16" archtop with cherry back, sides & neck and a red spruce top is my favorite archtop. 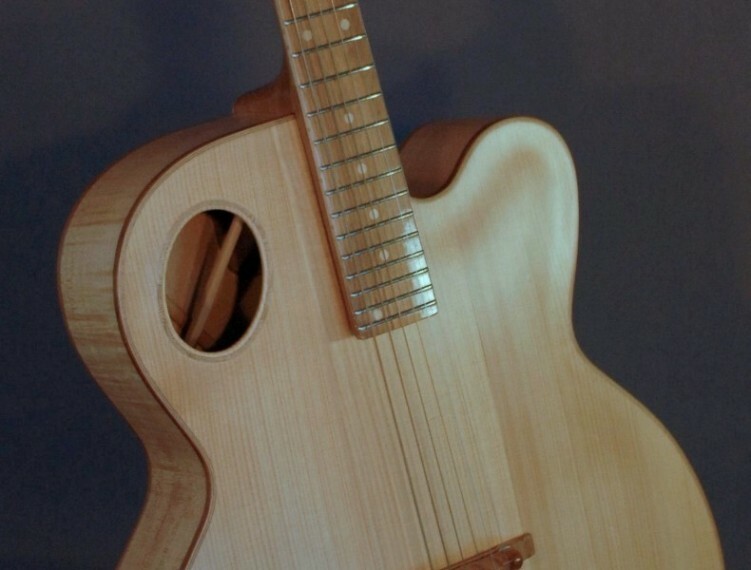 The smaller body size combined with the cherry & red spruce construction make the guitar loud and responsive while being light and confortable. 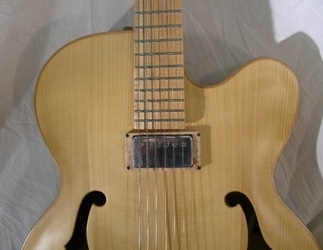 Strung with flatwound strings it's perfect for jazz. 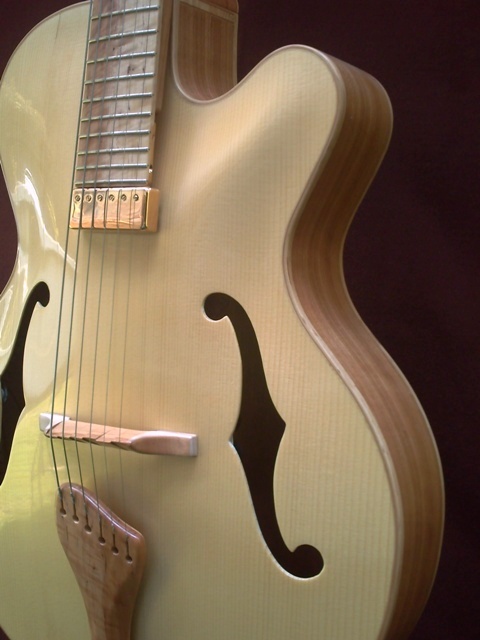 Strung with bronze round wound strings it becomes a very versatile guitar covering the span from Maybelle Carter to rock-a-billy and anything you would play on a steel string. Strung with electric guitar strings it becomes a great blues or a rock guitar. 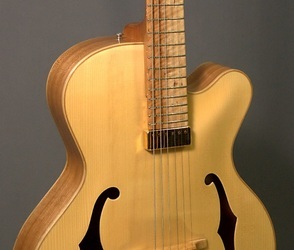 Scale lenght: 25 1/2 "
Lower bout widht: 16 "
Nut widht: 1 3/4 "
String spacing at the bridge: 2 1/4 "
" Saumier's archtop is bright and lively, with exceptional top end and high mids. The low end is tight and well defined (...). It plays easily and projects well, making it ideal for unmiked and studio applications." 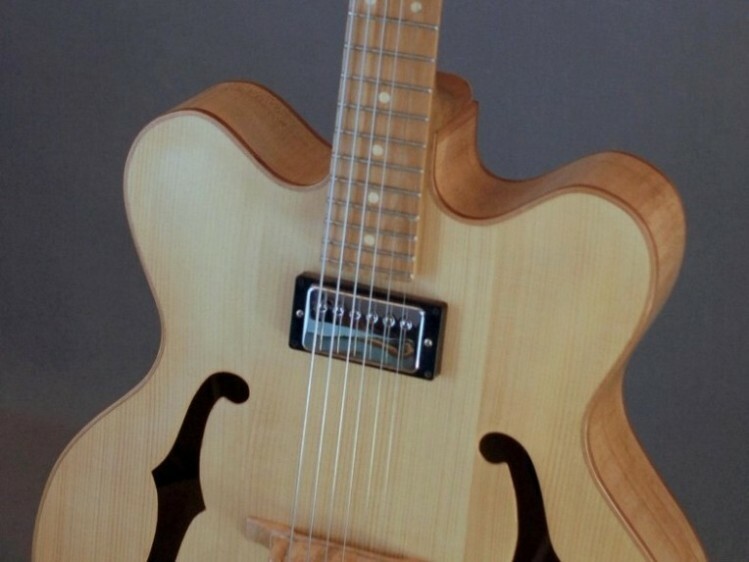 This 17" deep bodied maple archtop has Jazz written all over it. It is loud and punchy, well defined in all registers with really good note separation making it well suited for chords with close voicings or singing lead lines. It possesses a dry and crisp tone that, altough well suited for jazz, will make you want to try a couple of rock-a-billy or early fifties rock. 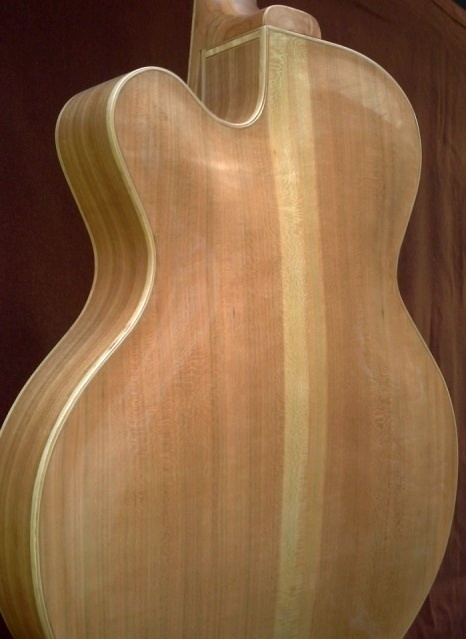 This 17" maple and red spruce hybrid archtop with an offset sound hole is in a class by itself. As all my guitars with an offset sound hole it has exceptional bass response, good volume & projection, sounds good in all registers and its sustain is uncommon for a guitar with a tailpiece and a floating bridge. The hybrid construction gives the guitar more harmonics and overtones than usually found on archtop guitars. It is my most versatile archtop. 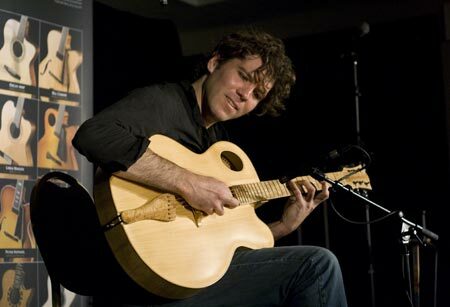 It handles gypsy or traditional jazz, folk, pop, or old time music with equal ease. Guitarists have told me they could play anything on this guitar.